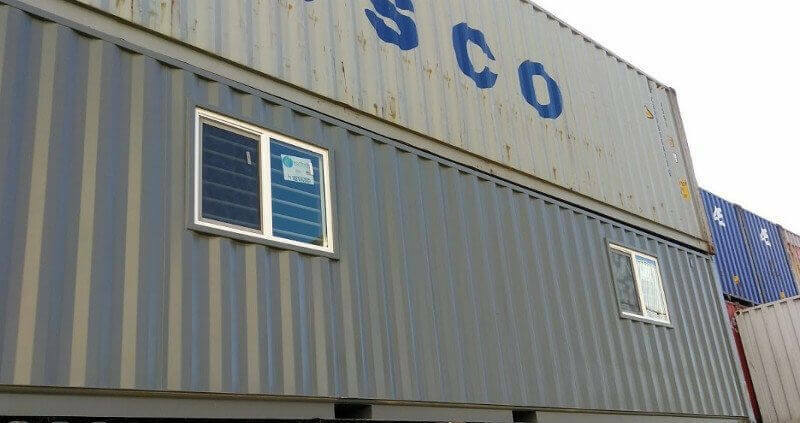 Shipping container windows are your first step into bringing day light into a dark storage container. With the day light you get the fresh air too. which in turns fight moisture and condensation. 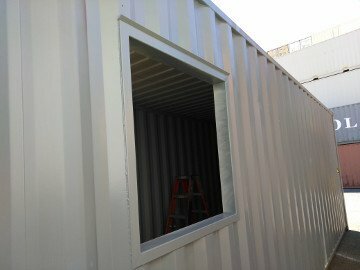 When the shipping container or storage container is used frequently adding windows will eliminate the need of installing louvered vents or roof mounted whirlybird vents to ventilate the container. Which can be costly. All you need to do to ventilate the storage container is open the windows a few minutes a day. Now shipping container windows might be the best solution to bring day light into the container but don't do much at night. For that time of the day a standard lighting system or a solar lighting system can be installed. Why do i need to install windows on my shipping container if i can install a lighting system you might ask. Well, shipping containers "Cargo Containers" are designed and built to be wind and watertight by default. If you stand inside a container and have someone close the doors on you, you will not be able to see your hand in front of your face. They get that dark inside. 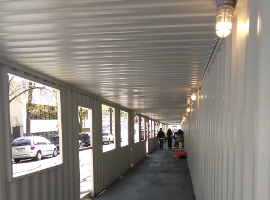 From experience just walking inside a shipping "Storage" container give you that unsettled feeling of being trapped. Even with so many lights installed you will still have that feeling. On the other hand walking inside the same shipping container with lighting system and some windows will eliminate that almost fear like feeling. It will actually but a smile on your face. The fact that i am standing inside what supposed to be dark, enclosed place. Yet it's illuminated and i can see the outside. 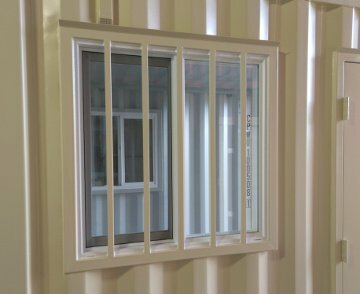 We get asked a lot about shipping container window kits. Not sure if we can call them kits. The ones we order and install usually comes as one piece. A shipping container vinyl window inside a 2X3 inch steel tube frame. Nothing to special about it. We pull the vinyl window out of the frame. Install the frame on the shipping container. Then insert the window in the frame and fasten it with some 5/16 self tapping bolts. Some of what called shipping container window kits comes with safety bars welded to the steel tube frame. Same thing remove the vinyl window. Install the frame and install the window. One thing we like to add to the shipping container window is what we called rain gutter. 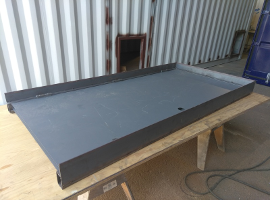 Which is a steel flat bar that we weld on the top edge of the window frame to help with diverting the water coming down the side of the container. 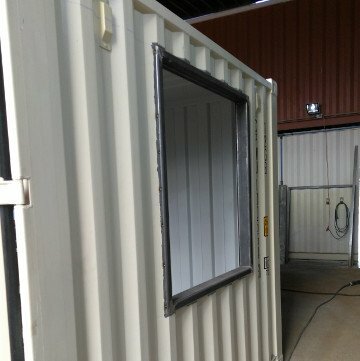 Mount windows in a cargo container is really easy. Start by lining up the window frame where you want it to be. Trace around the window frame. Cut the window opening with a cut off wheel. Insert the frame in the opening and weld all the way around. Insert the vinyl window in the frame. 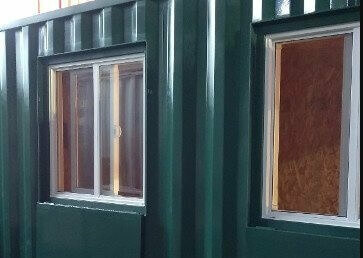 Most often when the customer order the installation of a shipping container windows they order a man door to be installed too. The benefits of having a window on a shipping container are almost endless. But you still have to deal with them huge and not too easy to open cargo doors. 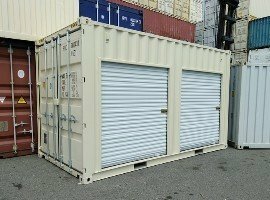 Installing a man door on the shipping container usually eliminate the need of using the cargo doors. So there you have it shipping container windows and shipping containers man doors go together like bread and butter. Not long ago we use to purchase our container windows from the local hardware store. Just a standard vinyl window, same as any other home window. We start by removing the vinyl window mounting flange "Nailing Flange" as there is no need for it. It's used for installing the window on a wooden frame not steel. Using a grinder with a fine sanding disk we clean the outside of the vinyl frame to remove whats lift from the flange and have a smooth surface. We take measurements and we use 2X3 inch steel tube to build the steel frame. All corners are cut at 45 degree angles. All welds get grind down flush with the surface of the steel tube and buffed with fine sanding disk to remove any grinding marks. 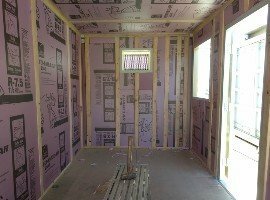 The steel frame will end up about 1/8 inch wider than the window vinyl frame for easy installation and expansion and contraction. 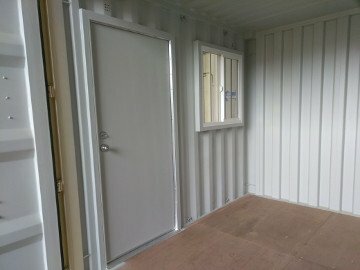 Recently the container windows we order comes with the steel frame which is nice. Saves us a lot of time installing the window. You are here looking shipping container windows right? Stop wasting your time searching, We got all what you are looking for. Get in touch with one of our cool sales representative to get a quote & answers to all your other questions.